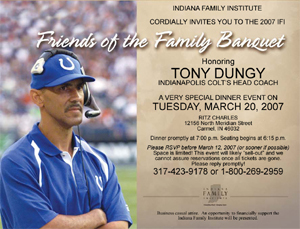 Indianapolis Colts coach Tony Dungy will be the honored guest at the March 20, 2007 annual banquet of the Indiana Family Institute (IFI), the state’s leading lobbying force against gay rights. The IFI prides itself on its sixteen-year history of “opposing all efforts to create or advance special civil or legal rights for homosexuals.” The IFI is closely aligned with Dr. James Dobson’s Focus on the Family, an anti-gay organization of long standing. On the Hoosier Family website, Dungy is prominently pictured in his Colts cap and jacket—confirming the team’s willingness to align with the IFI and giving supporters of gay rights reason to root for the Chicago Bears in Sunday’s Super Bowl. Virtually every article about Colts coach Tony Dungy praises him as a devoted family man of deep religious values. But Dungy’s values do not extend to tolerance for gays, which is why he will be the honored guest for Indiana’s leading anti-gay political organization. The IFI is a leading proponent of SJR7, the proposed Indiana Constitutional amendment on marriage rights, and other legislative efforts to deny equal rights to LGBT folks. While claiming to protect “family values,” it promotes measures that undermine gay families and the broader LGBT community. The enemies of SJR 7 are far more dangerous than the media and even most Christians realize. They not only want to destroy marriage and create a society free from any and all sexual boundaries, they will spare no effort to attain their ultimate goal of silencing all those who oppose them. You need only look at Canada and Sweden for the logical conclusion of their “this is our right” mentality. In those countries, citizens who speak out against the homosexual agenda are being charged with “hate speech” crimes and threatened with fines and jail time. Homosexual activists here in Indiana are using the same game plan as was used in those countries. Promoting marriage as defined in scripture is at odds with the views of these radicals. Thus, they define such ideas as “hate speech” and attempt to punish those who oppose them through the law. The Left embraces these activists, but we must strongly oppose them; for we may lose even more than marriage if we fail. Some may recall the homophobic rantings of the late Reggie White, a Hall of Fame defensive lineman who was a “deeply religious” minister. White’s attempt to stir up hatred against gays never interfered with media descriptions of him as a caring person who promoted family values. It would be bad enough if Dungy were boosting anti-gay political causes in his private life. But check the website of the IFI to see its huge photo of Dungy in Colts cap and jacket, showing that he is lending his stature as the Coach to anti-gay zealotry. Below Dungy’s photo is a huge picture of President George W. Bush, whose poll numbers are at historic lows but clearly remains popular with the IFI. After the Colts defeated the Patriots to reach the Super Bowl, Dungy claimed that God’s intervention brought the team victory. He did not simply say that God inspired him, or enabled him to believe the team could come back—he actually told a national audience that God played the key role in the Colt’s winning. Perhaps because Dungy is so popular with the media, nobody asked him why God would care who won the AFC Championship. Nor was Dungy asked why the Colts were more deserved of God’s favor than the Patriots, as New England fans also include many with religious views identical to those of Dungy. Dungy is deservedly praised for his being a path breaking African-American NFL coach, but this does not excuse him from denying civil rights to other oppressed minority groups.